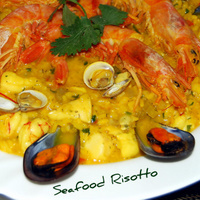 This seafood risotto recipe is creamy, light and delicious. If you are a seafood lover this will be your heaven. It's packed with fish and all the different taste's of the Mediterranean. Do not be put off by people who say these are difficult to make.... our version is pretty straight forward, and definately worth the effort. Just follow our easy step by step instructions and you will have a special dinner dish to remember. Put the stock into a medium sized sauce pan and bring up to the boil over a high heat. Add all of the fish cook for 2 minutes only then remove from the pan and put into a bowl covered with a plate to keep warm. Now add the prawn heads and simmer for 5 minutes. Remove from the stock and discard. Add the dill and the saffron to the stock and turn the heat down to low, then add the wine or vermouth. Keep the stock hot but under the boil. Now fry the onion and celery in the olive oil in a medium sized heavy based pan (that has a lid) over a medium heat until they are translucent. This Le Creuset pan is perfect. Then add the garlic and cook for a further minute. Add the rice and seasoning and cook for another 2-3 minutes stirring constantly until it goes opaque. Turn up the heat to medium again. Right - start adding a little of the stock/wine mixture a small ladle at a time, stirring constantly. As the rice simmers it will reduce down, then add another ladle of the hot liquid. Keep doing this, making sure that the risotto is well reduced before adding more liquid, and you will find the rice mixture begins to look creamy (as the rice cooks out) until all of the liquid has been added. This usually takes about 15-20 minutes. Remove from the heat and put the lid on the pan and allow to rest for 3-4 minutes - this allows all of the flavours to mingle with the rice, and produces a creamier risotto. Check for seasoning. 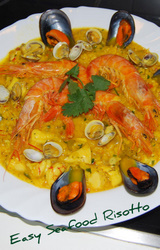 Pour into a serving bowl and garnish with the whole prawns and the mussels on the half shell.